If you could get up to 10 dB improvement in omnidirectional antenna gain for a given size wideband antenna, you'd design your radio to take advantage of it. Right? Modern software-defined and cognitive radios have RF circuits covering vast frequency ranges. Users often want 'unobtrusive' wideband antennas to go with them. But, the laws of physics make the prospect of very small antennas at militarily useful frequencies (like 30-88 MHz) quite a challenge, all the while wanting to extend coverage to, say, 520 MHz. 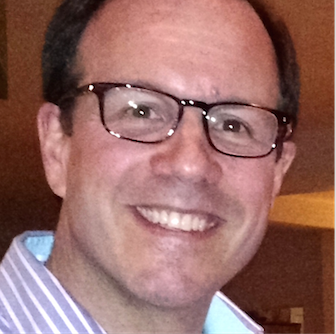 Antenna designers employ a handful of tricks to extend the frequency range of small wideband antennas. Often impedance-matching RLC networks are used to reduce mismatch losses as the antenna gets electrically small at its low frequencies. However, the widebands desired work against the ability of passive matching circuits covering the whole range to work best where matching is worst. If there were a way to dynamically adapt RLC values to obtain the best impedance match at each frequency of wideband antenna operation, that would be a huge win! Happily, the antenna experts at COJOT have achieved such performance improvement with their new family of adaptive antennas. By actively switching optimal matching circuits, autonomously or by radio control, the antenna is tuned to radiate best at the frequency of operation. 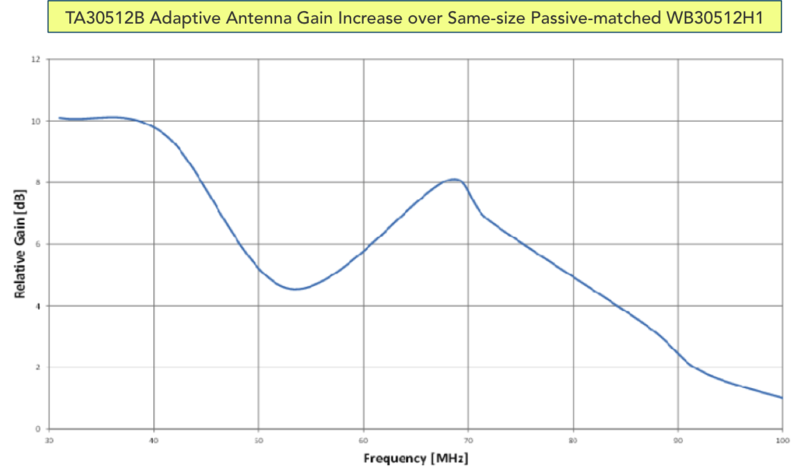 This graph shows the gain increase achieved by the TA30512H 30-520 MHz handheld/manpack ommidirectional adaptive antenna at the hardest-to-improve low end of its frequency range, versus the same sized passively matched WB30512H1 handheld radio wideband antenna. Note the 10 dB increase in gain between 30 and 40 MHz. Ten times more radiated power means vastly more transmission range, or the opportunity to reduce transmit power to an adaptive antenna to get the same range as a passively matched antenna needing much more power to overcome its losses. The trade-off is the need for active circuitry in the antenna, which draws some power, but, it's only 1 mW in the handheld version! The radio also needs to command the antenna to switch to the frequency desired. This only takes 30 microseconds. There is also a 30-90 MHz autonomous adaptive antenna for vehicles, ATA3090M, that senses the transmit frequency and automatically switches for best match in about 50 microseconds. That's easy.